I’m sure it didn’t escape anyone’s attention a couple of days back when they read my recommendations for the week. Amarone’s a bit on the punchy side, even for the supermarket BoBs. And it’s been pointed out to me that it’s one of those wines that if you skimp on, you’re in for a shock, and not a nice one. Yikes! Well there’s a reason Amarone costs so much. And as with most wines that are in that wallet trembling group, it’s got everything to do with how they’re made. It’s made out of predominately two red grape varieties, with a few small extras, the same as normal red wines of Valpolicella DOC. Corvina is the main one, and Rondinella plays a big supporting role. 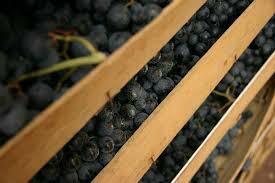 They’re grown the same way as normal grapes, they’re harvested at ripeness the same as normal grapes. But…once they’re harvested they’re stuck on straw mats for 3 months or more to dry out. Remember: time is money! What does the drying out process do? It concentrates the flavours so you get massive fruit hits. It concentrates the sugars so you tend to get heavy alcohol contents (15-17%). It means the grape skin to grape pulp ratio is higher, so the colour and tannin (which comes from the skin) is much punchier. Amarones are dark in colour with big bruising bodies on them. They’re then stuck in barrels for all these massive components to work out a way to live together in a bottle. Again, time drags on, but it’s worth it! This is not one for the faint hearted or, I’m afraid to say, a tight budget!